Wayde King was born in Long Island, New York, USA. He is a reality television personality and businessman best known for appearing as part of the Animal Planet show “Tanked”. He is the owner and manager of the company Acrylic Tank Manufacturing or ATM, and these efforts have raised his net worth to where it is now. How rich is Wayde King? As of mid-2016, sources estimate a net worth that is at $5 million, mostly earned through the success of the show and his business. He has earned high amounts of money and a loyal customer base due to his skills, and ability to deliver. As he continues to work it is expected that his wealth will rise higher. King started learning about fish at a young age since his father was a fish dealer. The family always had tanks and fishes in the basement of their house, and he slowly started to become familiar with them. He was usually the help in cleaning aquariums, among other things. He started his career after moving to Las Vegas, and going to work for an aquarium manufacturing company. While he was there he learned the ins and outs of that business, and it eventually led him to start his own company called Acrylic Tank Manufacturing. He slowly built up his reputation, and now while as CEO of the company, it has become one of the most successful aquarium manufacturers in the world. After this success, they were then approached by Animal Planet for the reality series “Tanked”, and the show has become one of the most popular series on the channel. It has even expanded with re-releases such as “Tanked: Unfiltered”. The company includes family members such as brother-in-law Brett Raymer as the COO and Wayde’s wife Heather as the accountant. His father-in-law Irwin became the office manager, and these and most of the rest of the staff are featured on “Tanked”. The business has now been running for more than 30 years. “Tanked” features what is usually the day-to-day job of Acrylic Tank Management, where Wayde designs and manufactures mostly large and personalized aquariums. Throughout the process, the team takes the client through each step, on what type of fishes and the preferences for the acrylic tanks. The show has been running since 2011, and recently finished its ninth season which aired from May 2015 until January 2016; clearly the popularity of the show has made it a recurring program on Animal Planet. The show has had numerous celebrities and high profile guests including Neil Patrick Harris and Bart Scott. For his personal life, Wayde is married to Heather Raymer King, and the both of them run the business with other family members. They are both featured heavily on the show as they are the owners of the shop. According to Wayde, fishes and aquariums are his passion and he’s happy that he gets to spend time doing it with his family. 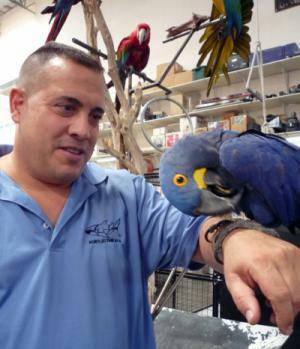 He’s also a pet lover, having dogs, cats and macaws in their home. King is also a fan of scuba diving. Tanked 2012-2017 TV Series Corrected character description to reflect what was shown on the screen.